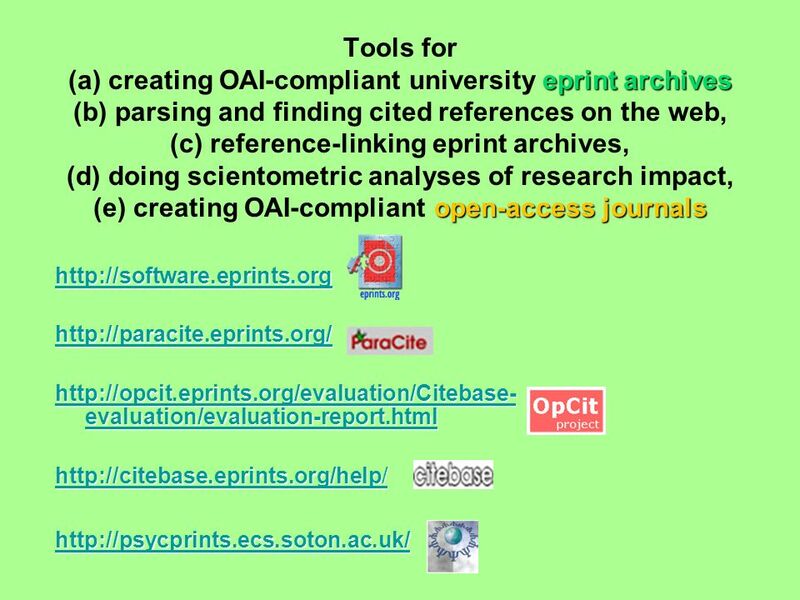 These slides were made by Tim Brody and Stevan Harnad (Southampton University) Permission is granted to use them to promote open access and self-archiving. 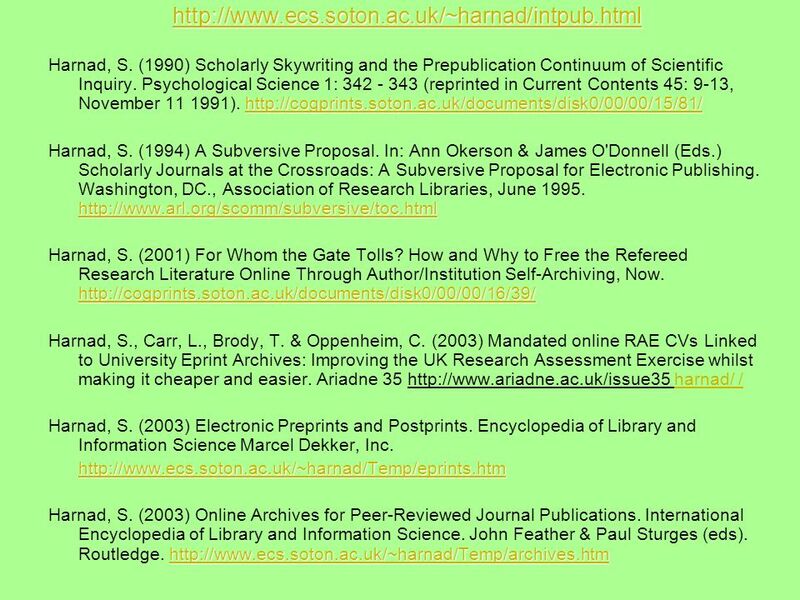 1 These slides were made by Tim Brody and Stevan Harnad (Southampton University) Permission is granted to use them to promote open access and self-archiving as long as their source is acknowledged. 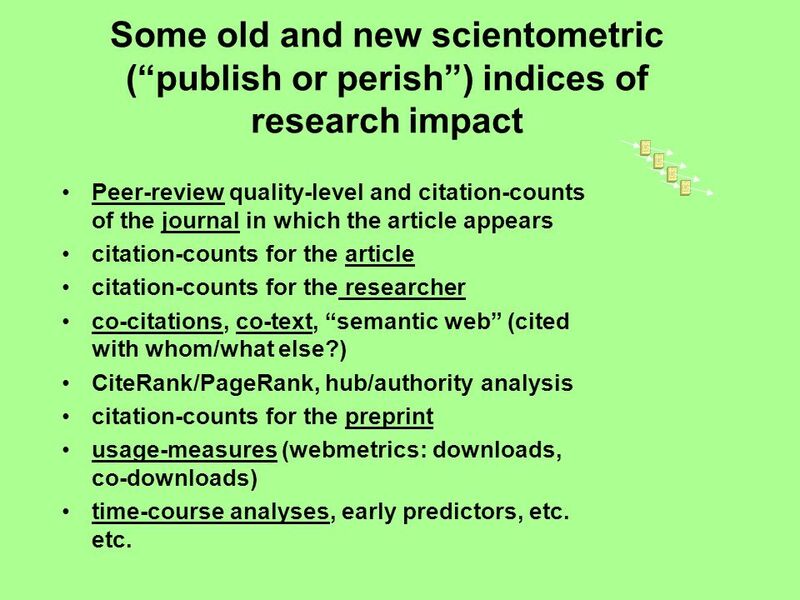 10 Some old and new scientometric (publish or perish) indices of research impact Peer-review quality-level and citation-counts of the journal in which the article appears citation-counts for the article citation-counts for the researcher co-citations, co-text, semantic web (cited with whom/what else?) 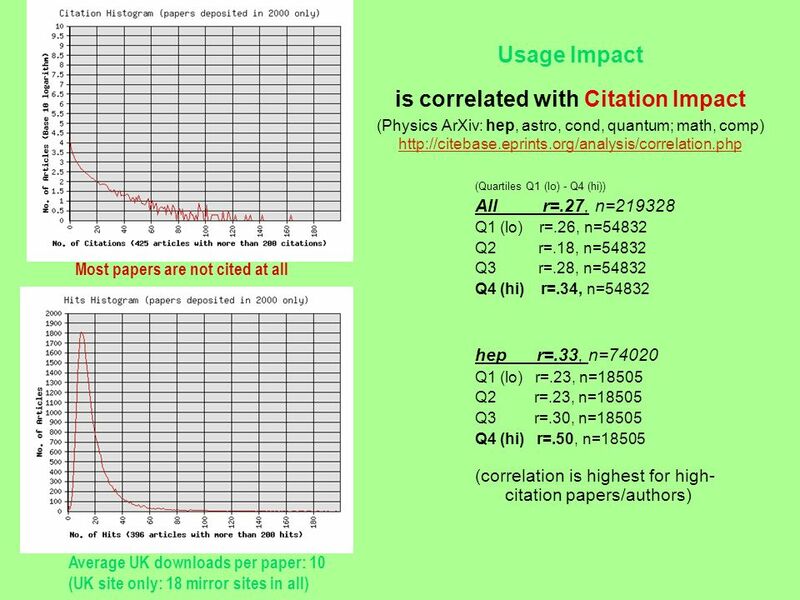 CiteRank/PageRank, hub/authority analysis citation-counts for the preprint usage-measures (webmetrics: downloads, co-downloads) time-course analyses, early predictors, etc. etc. 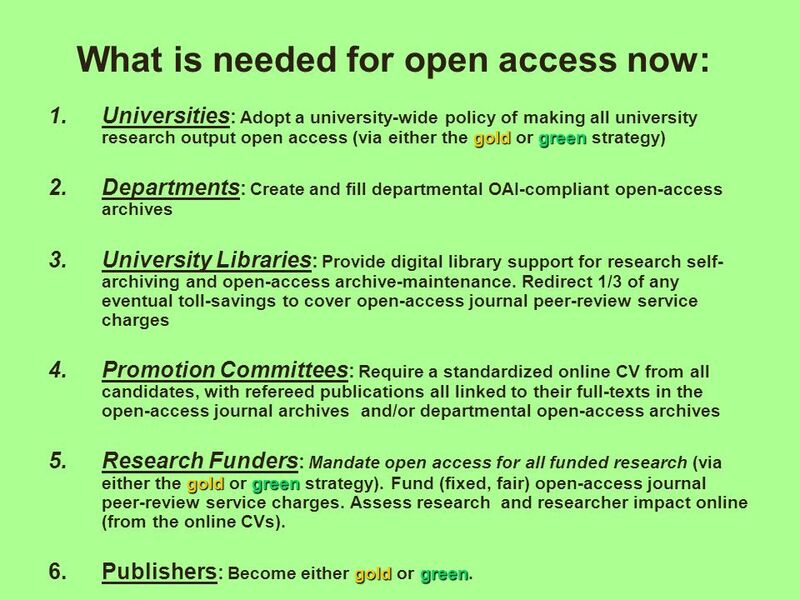 22 What is needed for open access now: goldgreen 1.Universities : Adopt a university-wide policy of making all university research output open access (via either the gold or green strategy) 2.Departments : Create and fill departmental OAI-compliant open-access archives 3.University Libraries : Provide digital library support for research self- archiving and open-access archive-maintenance. 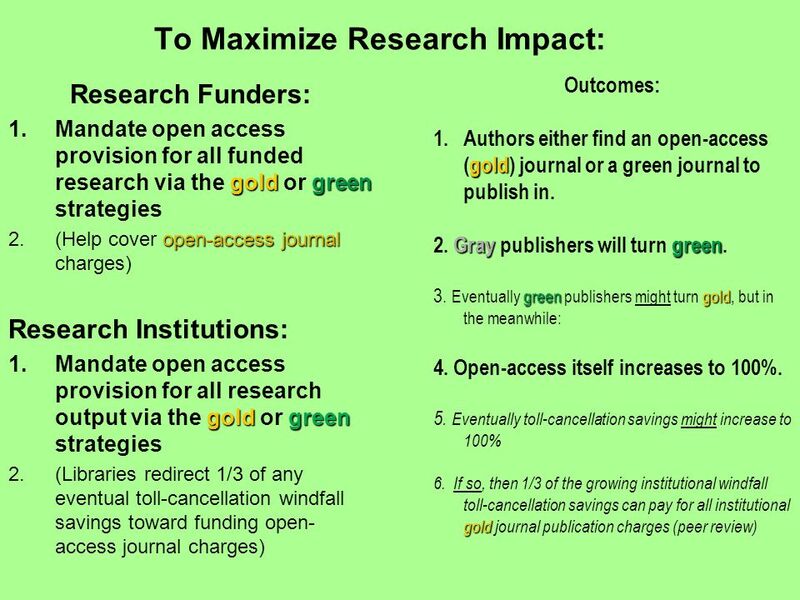 Redirect 1/3 of any eventual toll-savings to cover open-access journal peer-review service charges 4.Promotion Committees : Require a standardized online CV from all candidates, with refereed publications all linked to their full-texts in the open-access journal archives and/or departmental open-access archives gold green 5.Research Funders : Mandate open access for all funded research (via either the gold or green strategy). 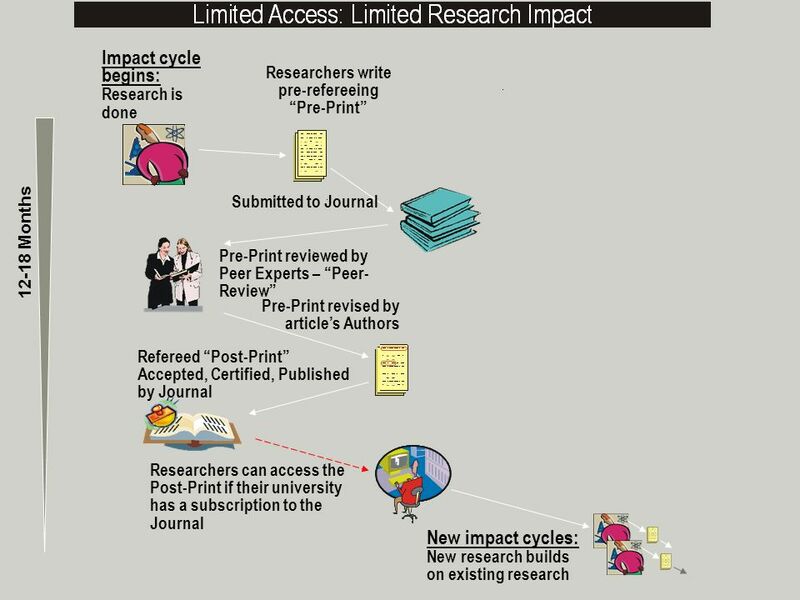 Fund (fixed, fair) open-access journal peer-review service charges. 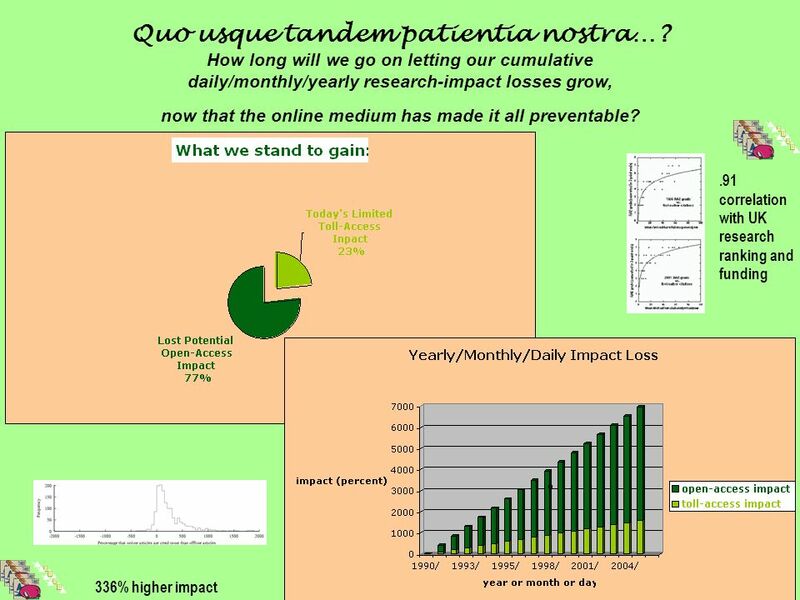 Assess research and researcher impact online (from the online CVs). 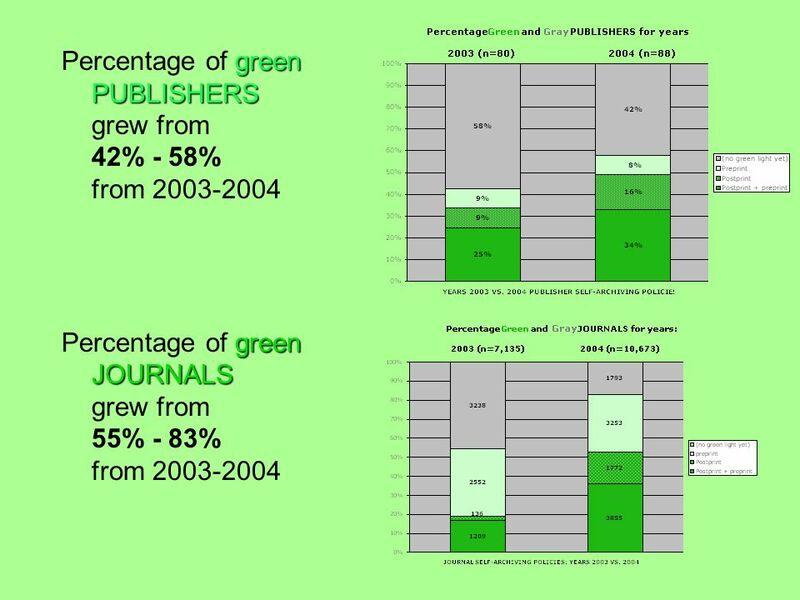 goldgreen 6.Publishers : Become either gold or green. 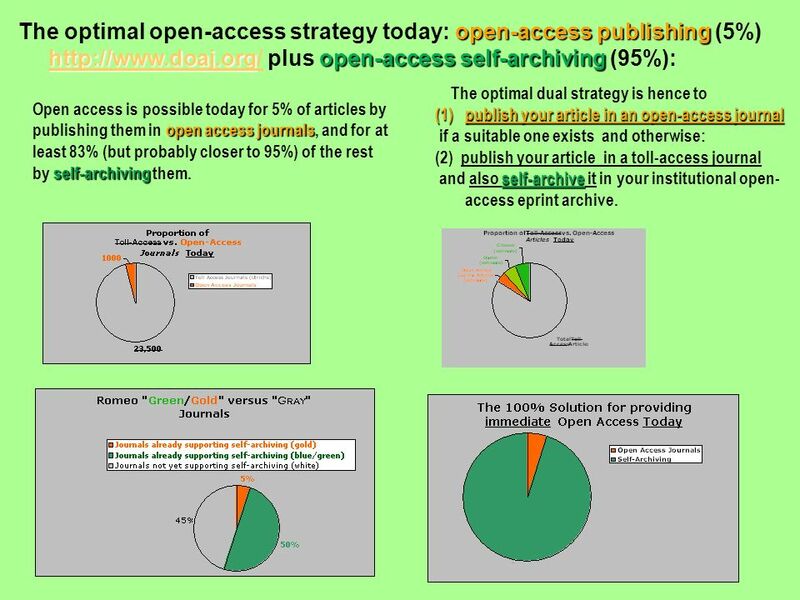 24 open-access publishing http://www.doaj.orgopen-access self-archiving The optimal open-access strategy today: open-access publishing (5%) http://www.doaj.org/ plus open-access self-archiving (95%): http://www.doaj.org / Open access is possible today for 5% of articles by open access journals publishing them in open access journals, and for at least 83% (but probably closer to 95%) of the rest self-archiving by self-archiving them. 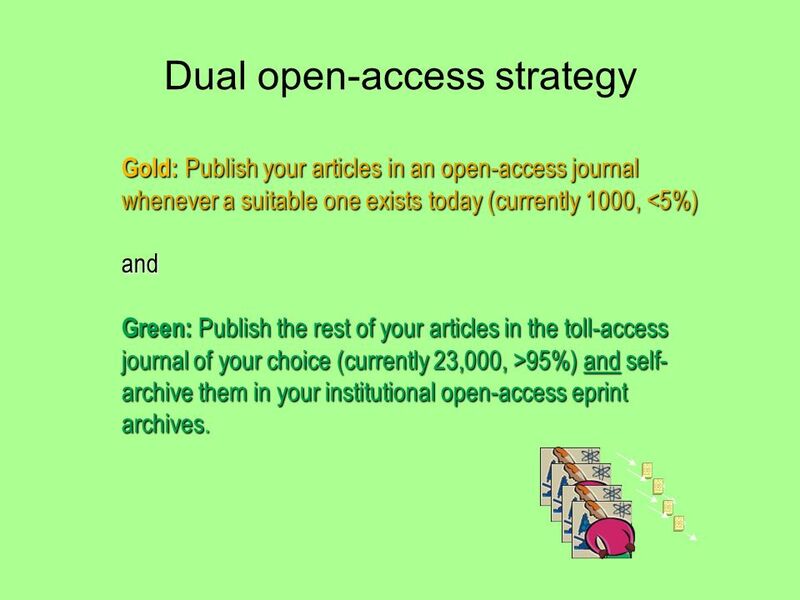 The optimal dual strategy is hence to (1)publish your article in an open-access journal if a suitable one exists and otherwise: (2) publish your article in a toll-access journal self-archive and also self-archive it in your institutional open- access eprint archive. 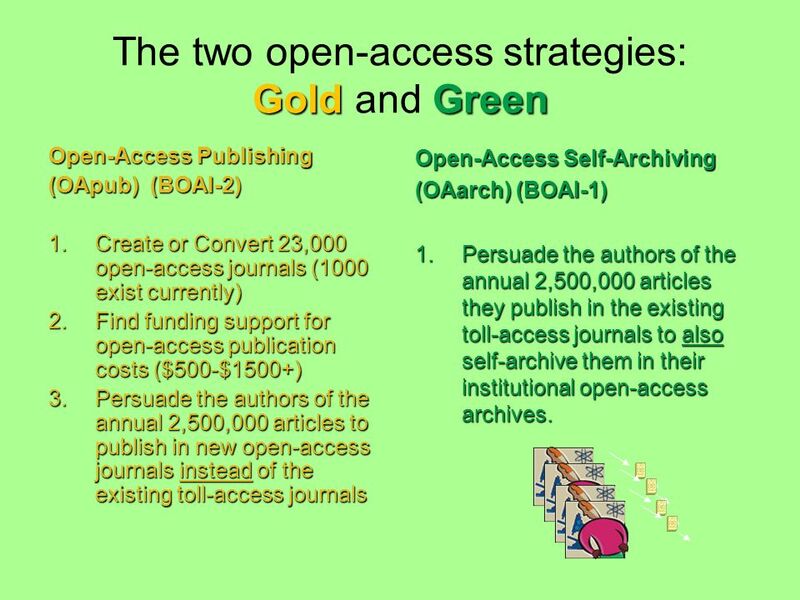 26 GoldGreen The two open-access strategies: Gold and Green Open-Access Publishing (OApub) (BOAI-2) 1.Create or Convert 23,000 open-access journals (1000 exist currently) 2.Find funding support for open-access publication costs ($500-$1500+) 3.Persuade the authors of the annual 2,500,000 articles to publish in new open-access journals instead of the existing toll-access journals Open-Access Self-Archiving (OAarch) (BOAI-1) 1.Persuade the authors of the annual 2,500,000 articles they publish in the existing toll-access journals to also self-archive them in their institutional open-access archives. 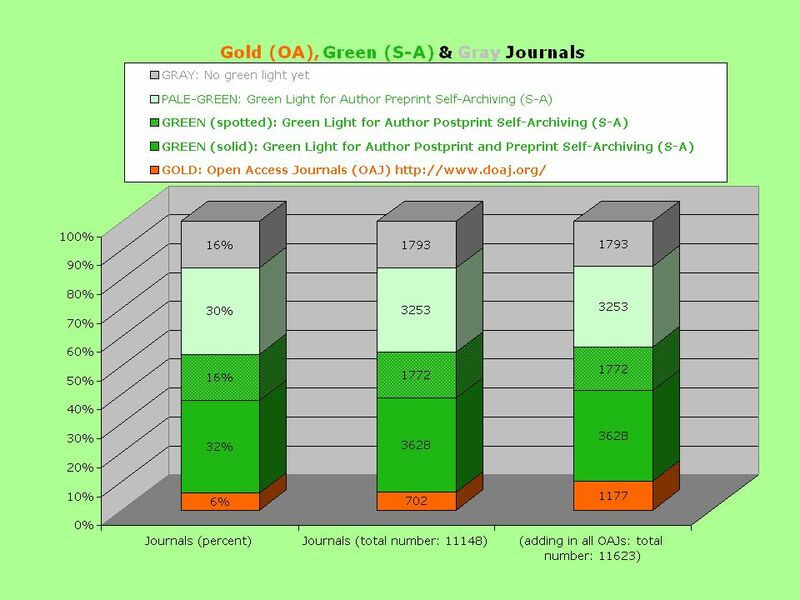 27 Dual open-access strategy Gold: Publish your articles in an open-access journal whenever a suitable one exists today (currently 1000, <5%) and Green: Publish the rest of your articles in the toll-access journal of your choice (currently 23,000, >95%) and self- archive them in your institutional open-access eprint archives. 29 Berlin Declaration on Open Access to Knowledge in the Sciences and Humanities http://www.zim.mpg.de/openaccess-berlin/berlindeclaration.html http://www.zim.mpg.de/openaccess-berlin/berlindeclaration.html The pertinent passages: Open access [means]: 1. free... [online, full-text] access 2. 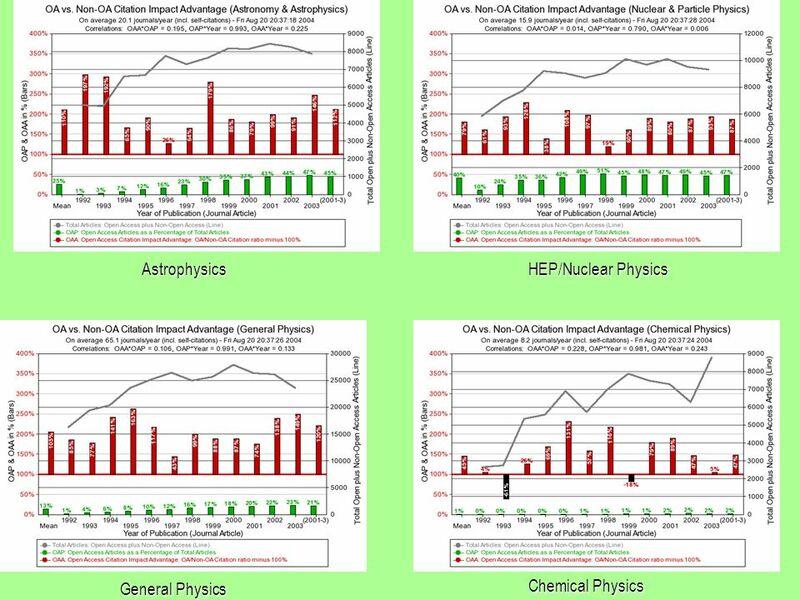 A complete version of the [open-access] work... is deposited... in at least one online repository... to enable open access, unrestricted distribution, [OAI] interoperability, and long-term archiving. 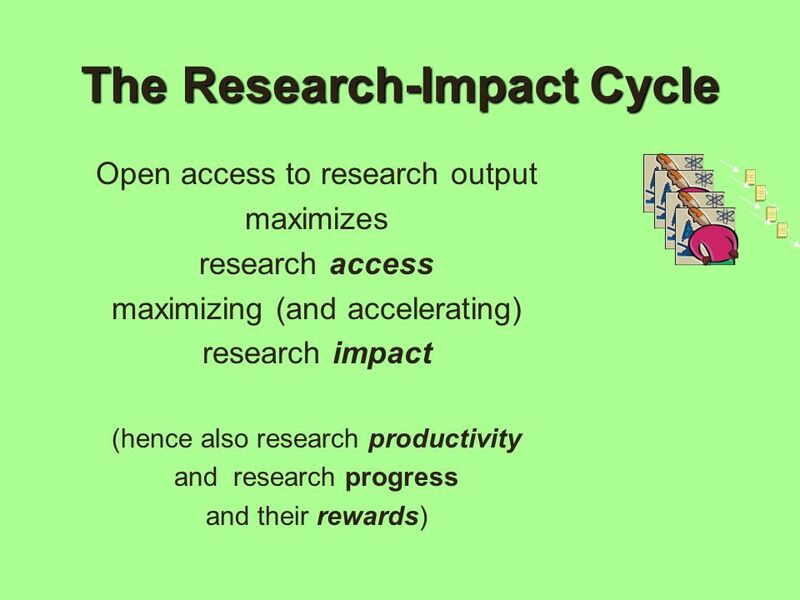 [W]e intend to... encourag[e].. our researchers/grant recipients to publish their work according to the principles of... open access. 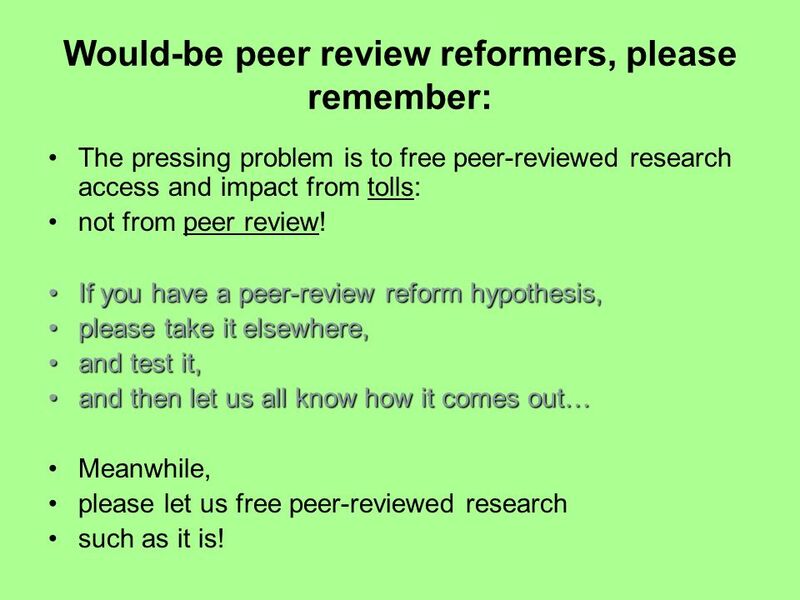 46 Would-be peer review reformers, please remember: The pressing problem is to free peer-reviewed research access and impact from tolls: not from peer review! 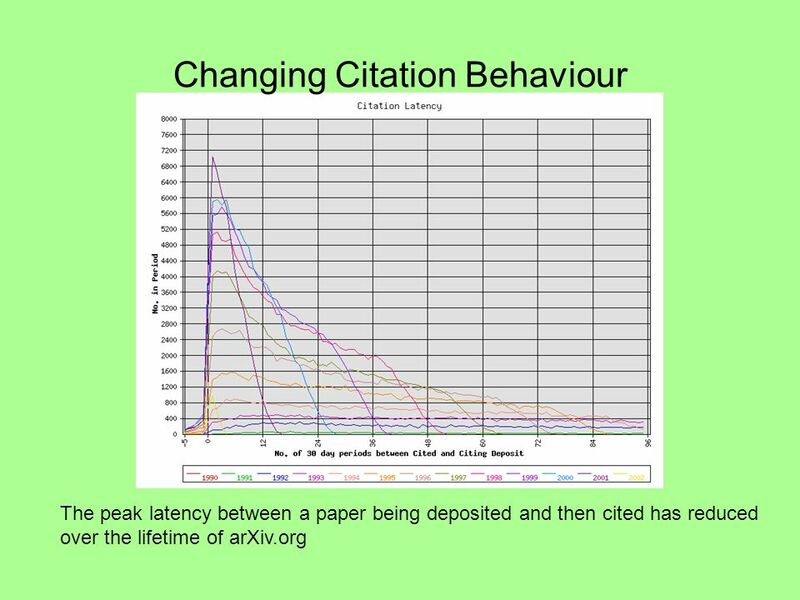 If you have a peer-review reform hypothesis,If you have a peer-review reform hypothesis, please take it elsewhere,please take it elsewhere, and test it,and test it, and then let us all know how it comes out…and then let us all know how it comes out… Meanwhile, please let us free peer-reviewed research such as it is! 47 Universal Access Through Affordable Licensing? 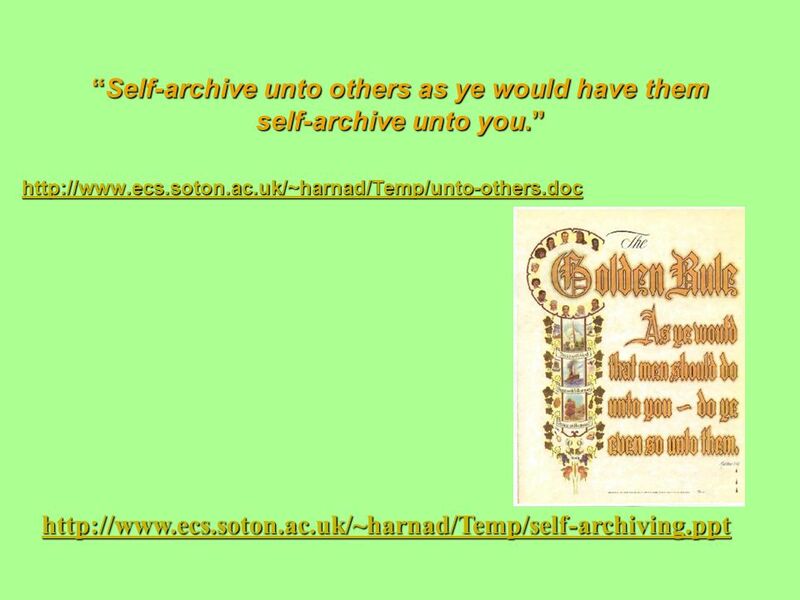 Open access through author/institution self-archiving is a parallel self-help measure for researchers, to prevent further impact-loss now. 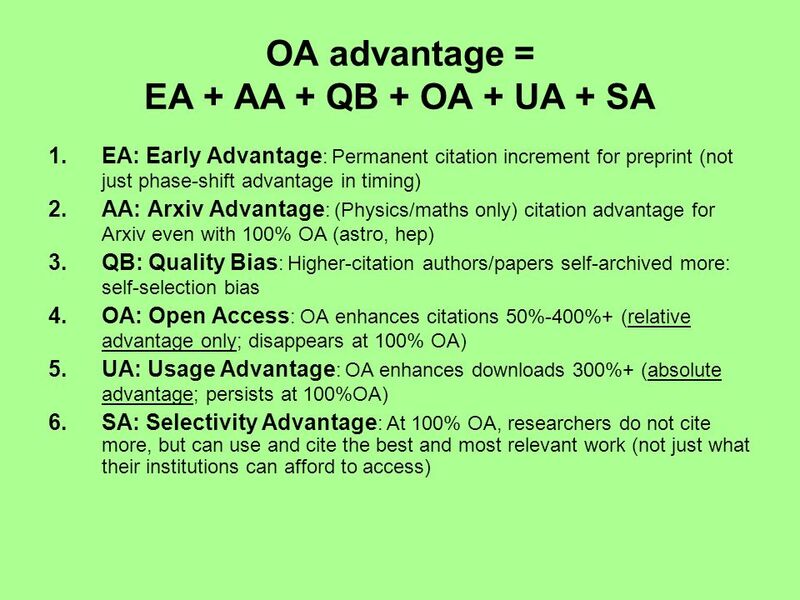 Open access is a supplement to toll-access, but not necessarily a substitute for it. 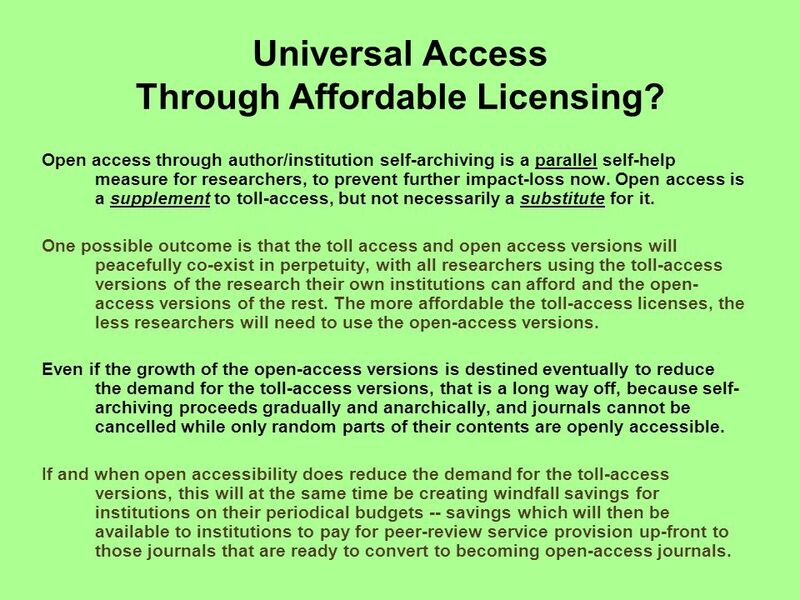 One possible outcome is that the toll access and open access versions will peacefully co-exist in perpetuity, with all researchers using the toll-access versions of the research their own institutions can afford and the open- access versions of the rest. 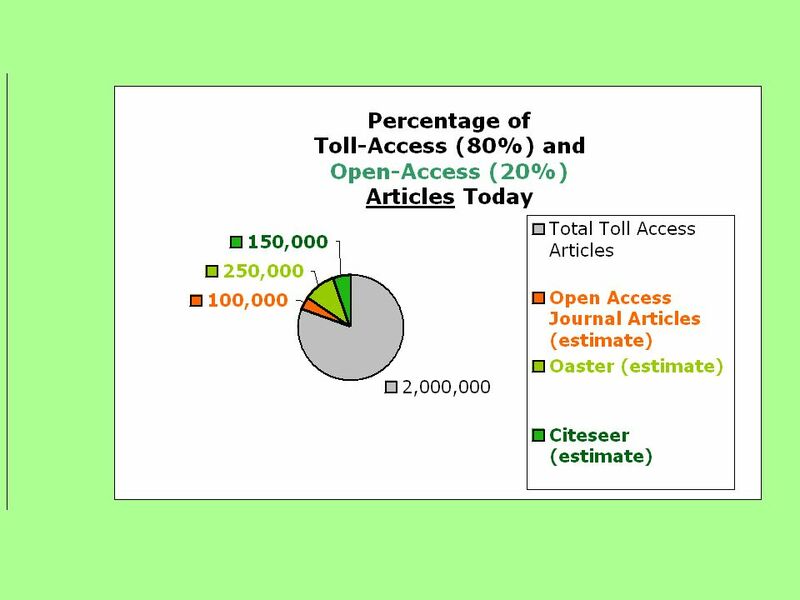 The more affordable the toll-access licenses, the less researchers will need to use the open-access versions. 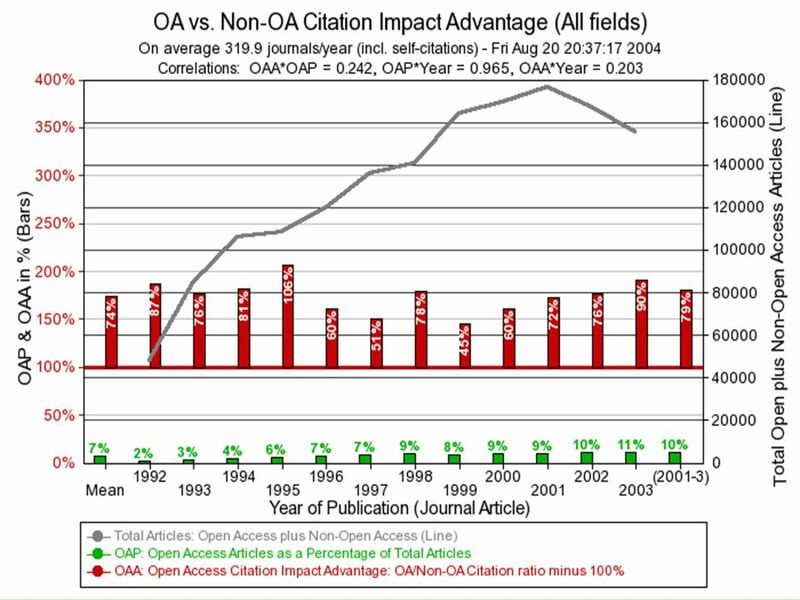 Even if the growth of the open-access versions is destined eventually to reduce the demand for the toll-access versions, that is a long way off, because self- archiving proceeds gradually and anarchically, and journals cannot be cancelled while only random parts of their contents are openly accessible. 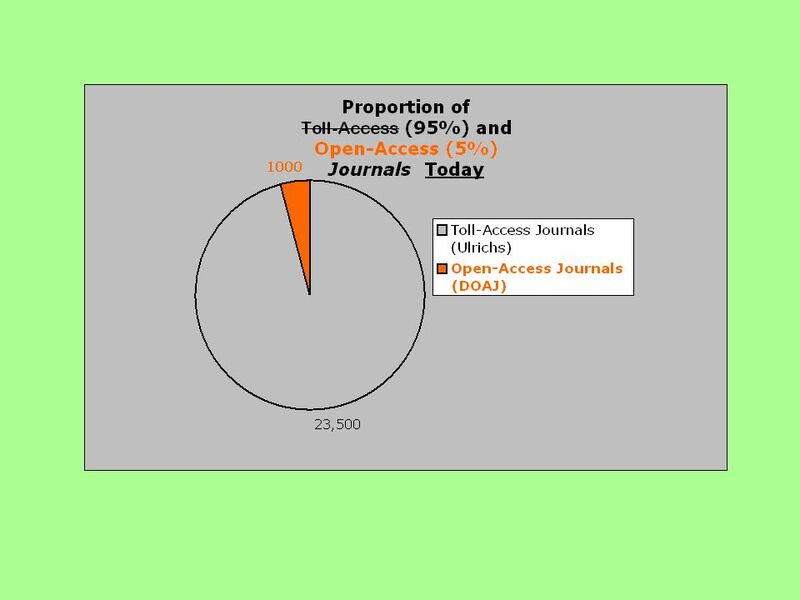 If and when open accessibility does reduce the demand for the toll-access versions, this will at the same time be creating windfall savings for institutions on their periodical budgets -- savings which will then be available to institutions to pay for peer-review service provision up-front to those journals that are ready to convert to becoming open-access journals. 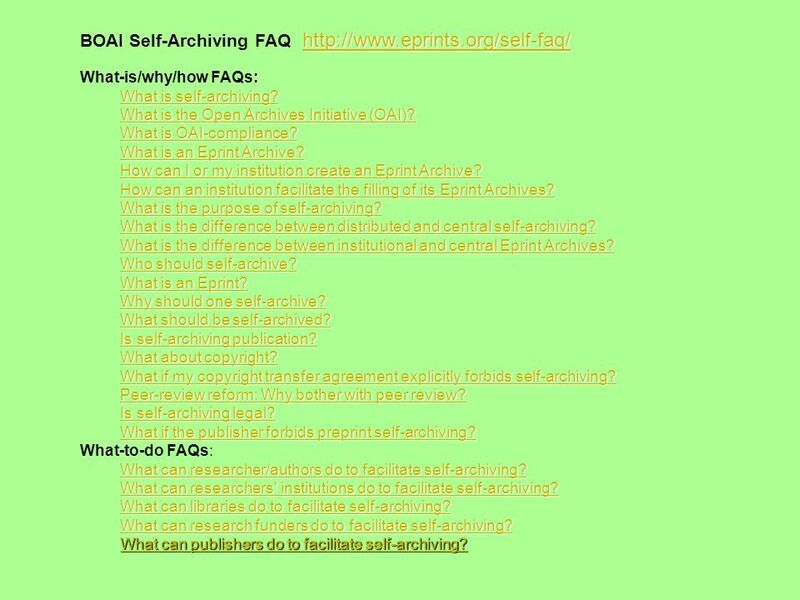 54 http://www.eprints.org/self-faq/ http://www.eprints.org/self-faq/ BOAI Self-Archiving FAQ http://www.eprints.org/self-faq/ http://www.eprints.org/self-faq/ : What-is/why/how FAQs: What is self-archiving? What is self-archiving? 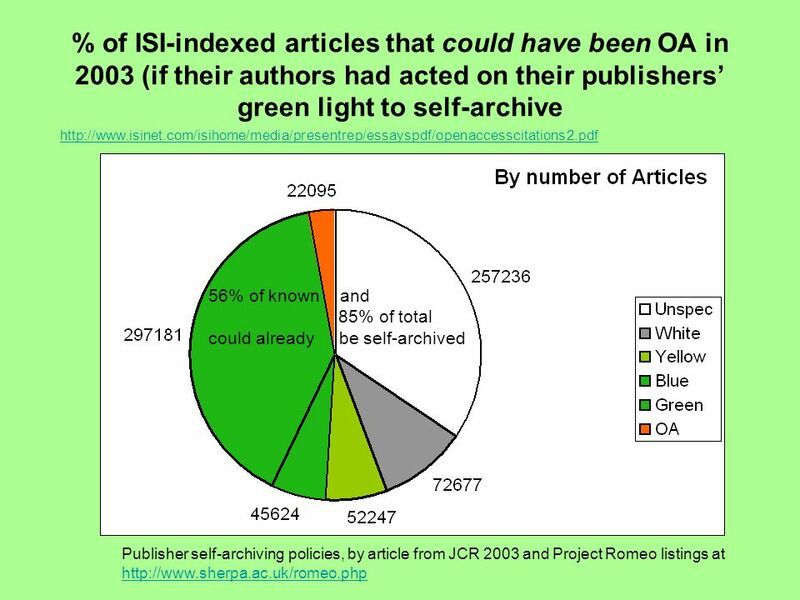 What is the Open Archives Initiative (OAI)? 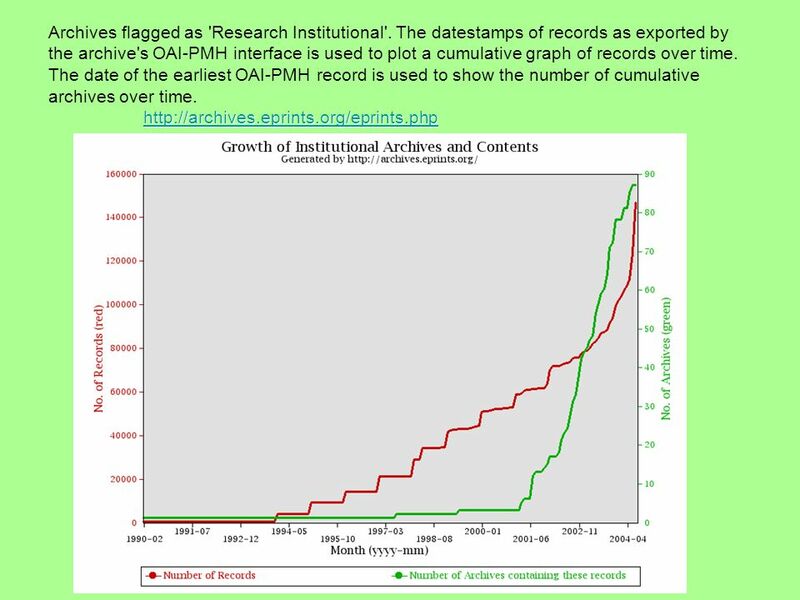 What is the Open Archives Initiative (OAI)? What is OAI-compliance? What is OAI-compliance? 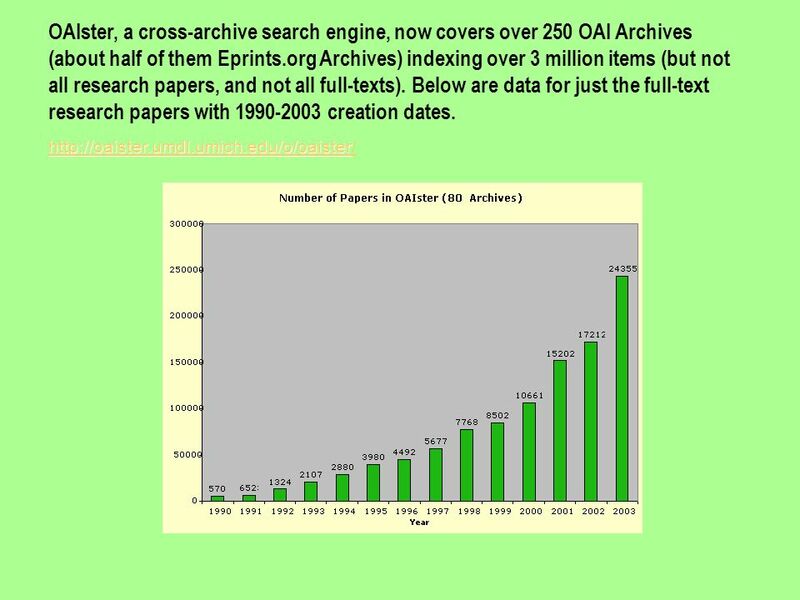 What is an Eprint Archive? 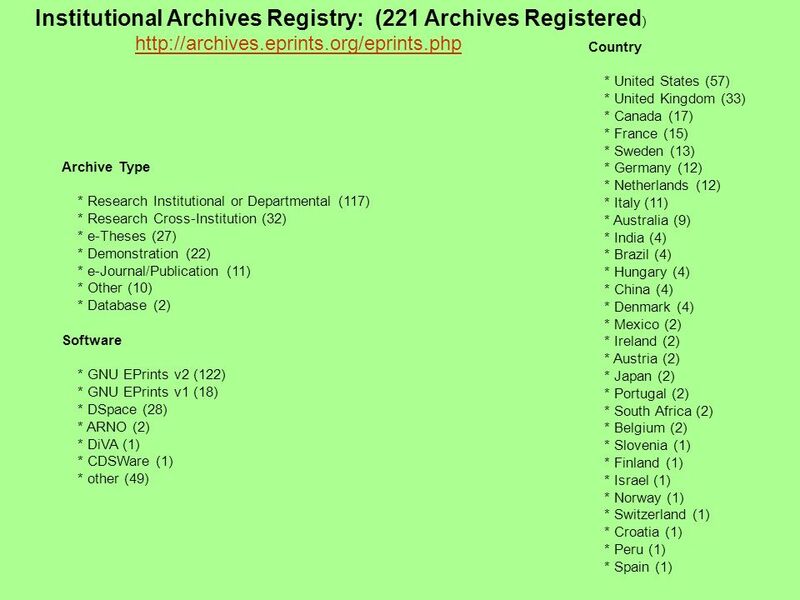 What is an Eprint Archive? How can I or my institution create an Eprint Archive? How can I or my institution create an Eprint Archive? How can an institution facilitate the filling of its Eprint Archives? 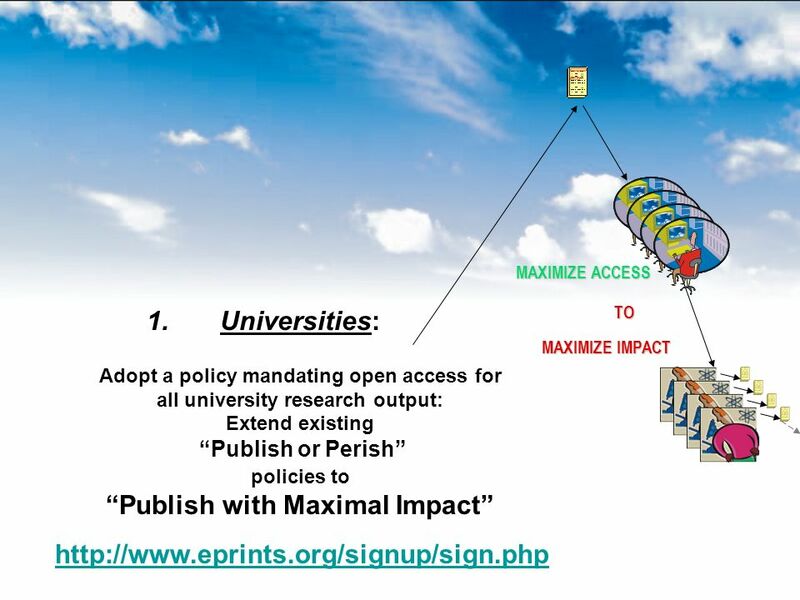 How can an institution facilitate the filling of its Eprint Archives? What is the purpose of self-archiving? What is the purpose of self-archiving? What is the difference between distributed and central self-archiving? What is the difference between distributed and central self-archiving? What is the difference between institutional and central Eprint Archives? What is the difference between institutional and central Eprint Archives? Who should self-archive? Who should self-archive? What is an Eprint? What is an Eprint? Why should one self-archive? Why should one self-archive? What should be self-archived? What should be self-archived? 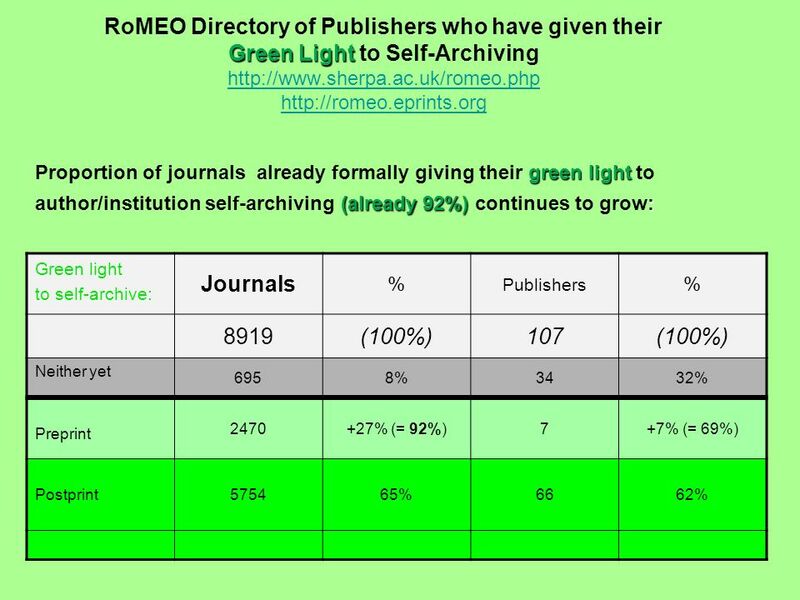 Is self-archiving publication? 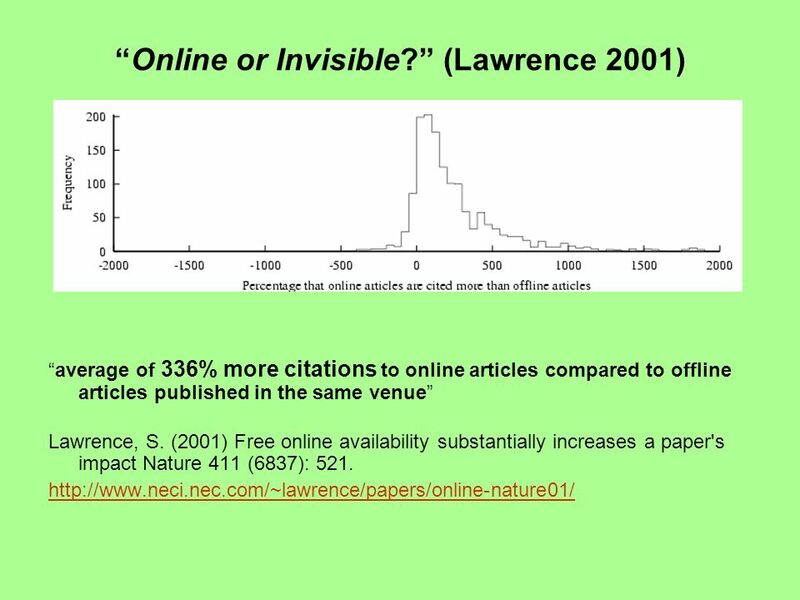 Is self-archiving publication? What about copyright? What about copyright? What if my copyright transfer agreement explicitly forbids self-archiving? What if my copyright transfer agreement explicitly forbids self-archiving? 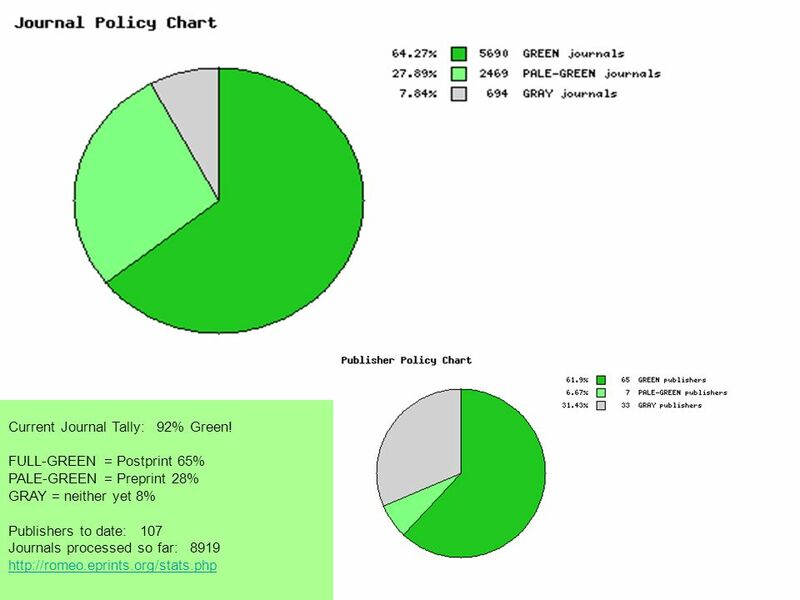 Peer-review reform: Why bother with peer review? 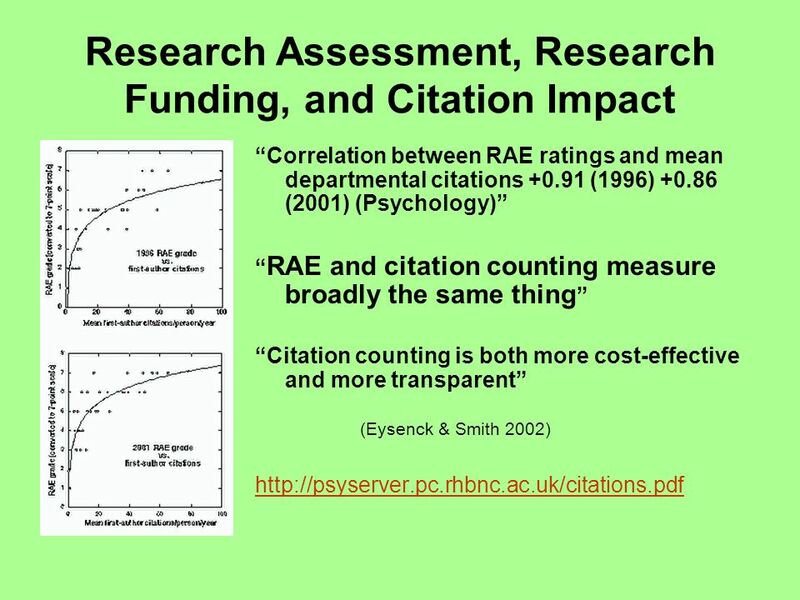 Peer-review reform: Why bother with peer review? Is self-archiving legal? Is self-archiving legal? 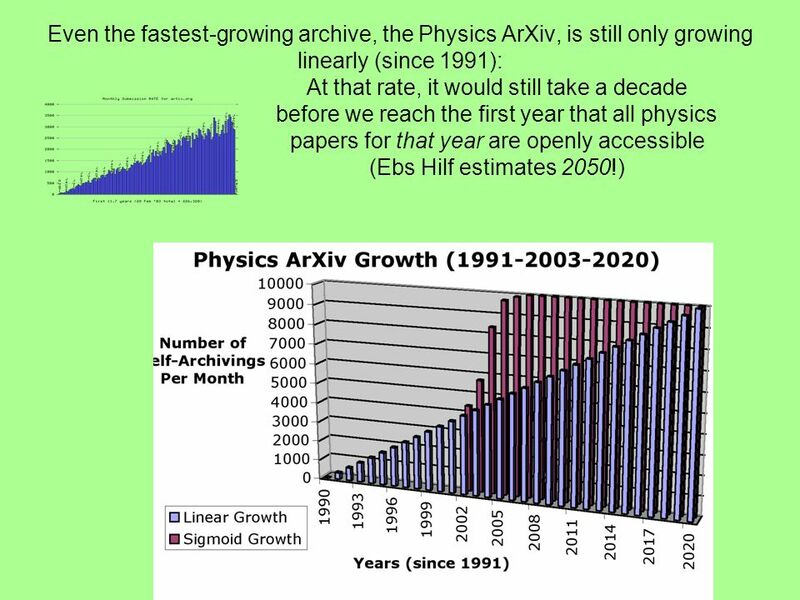 What if the publisher forbids preprint self-archiving? 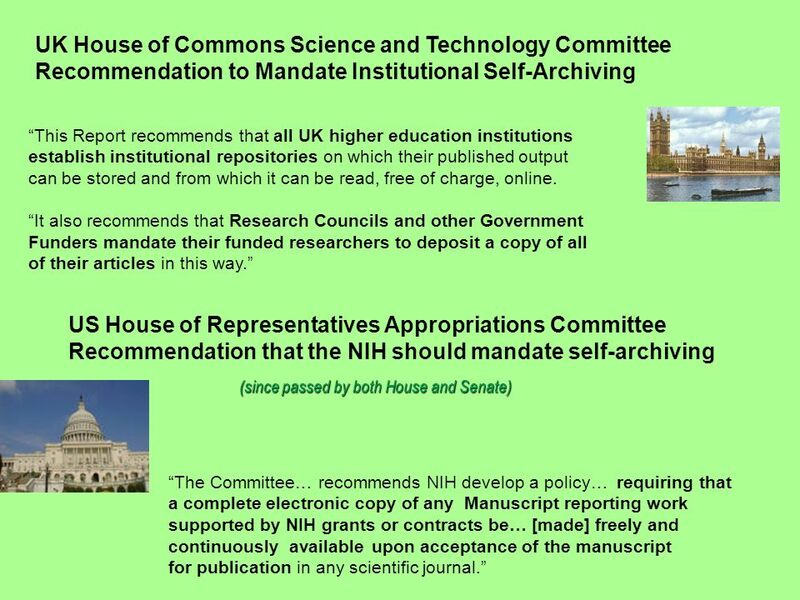 What if the publisher forbids preprint self-archiving? What-to-do FAQs: What can researcher/authors do to facilitate self-archiving? 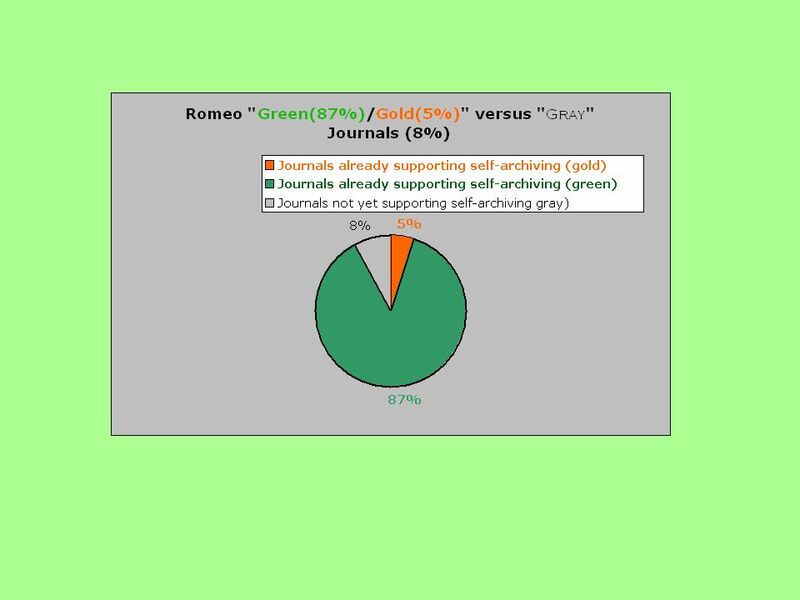 What can researcher/authors do to facilitate self-archiving? 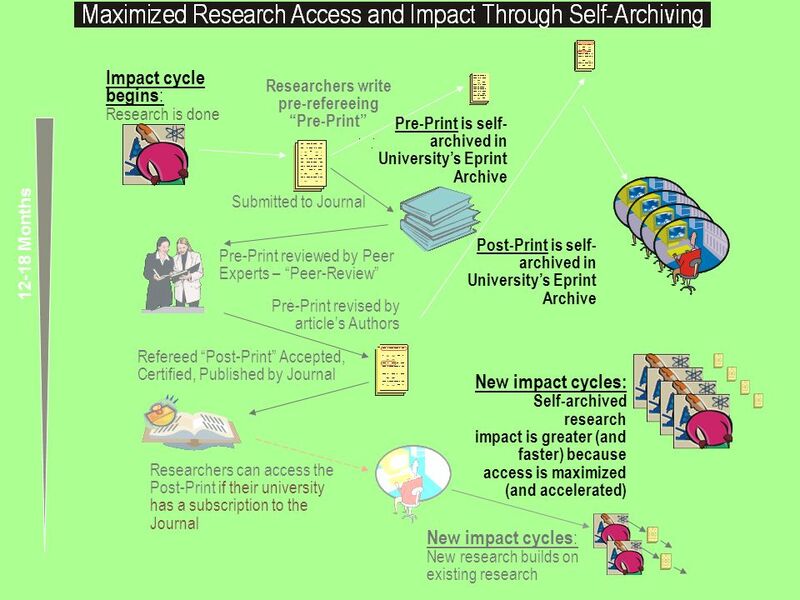 What can researchers' institutions do to facilitate self-archiving? What can researchers' institutions do to facilitate self-archiving? What can libraries do to facilitate self-archiving? What can libraries do to facilitate self-archiving? What can research funders do to facilitate self-archiving? What can research funders do to facilitate self-archiving? What can publishers do to facilitate self-archiving? What can publishers do to facilitate self-archiving? 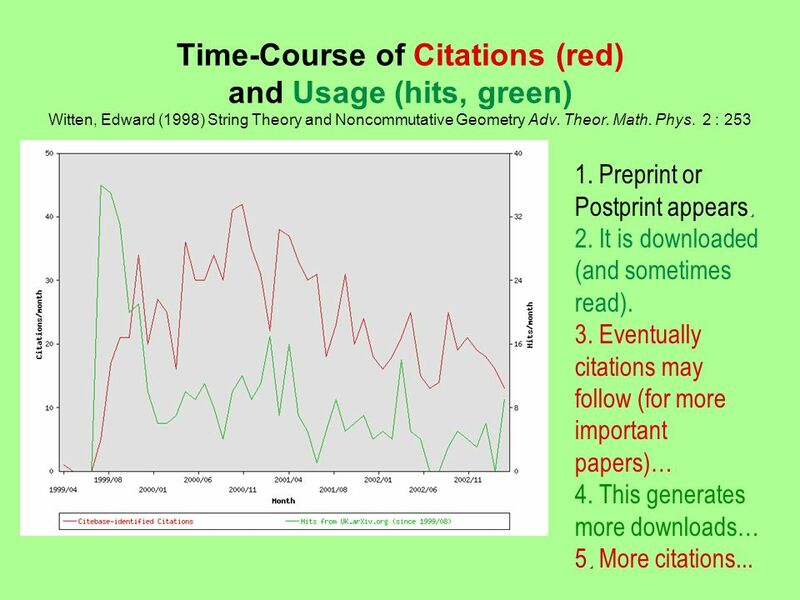 Download ppt "These slides were made by Tim Brody and Stevan Harnad (Southampton University) Permission is granted to use them to promote open access and self-archiving." 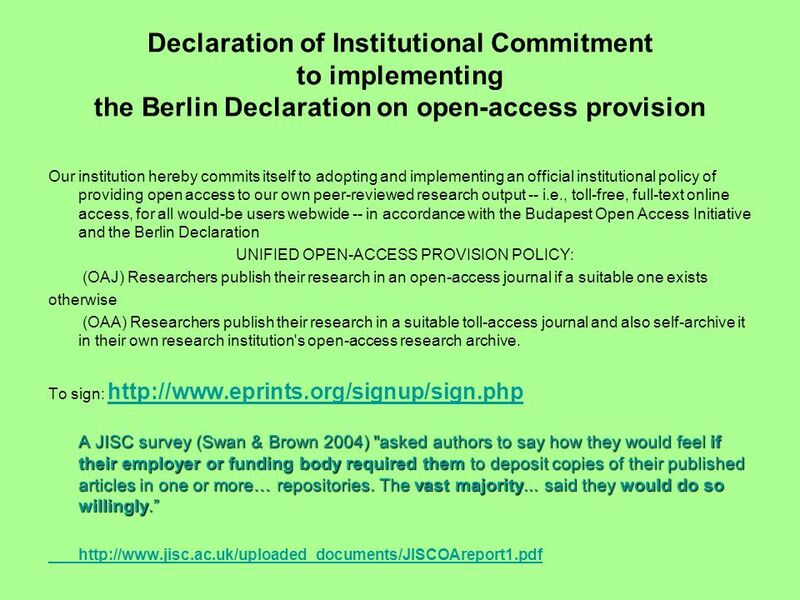 Open Access: lets KISS and make up An introduction to OA for institutional repositories Steve Hitchcock School of ECS, IAM Group, Southampton University. 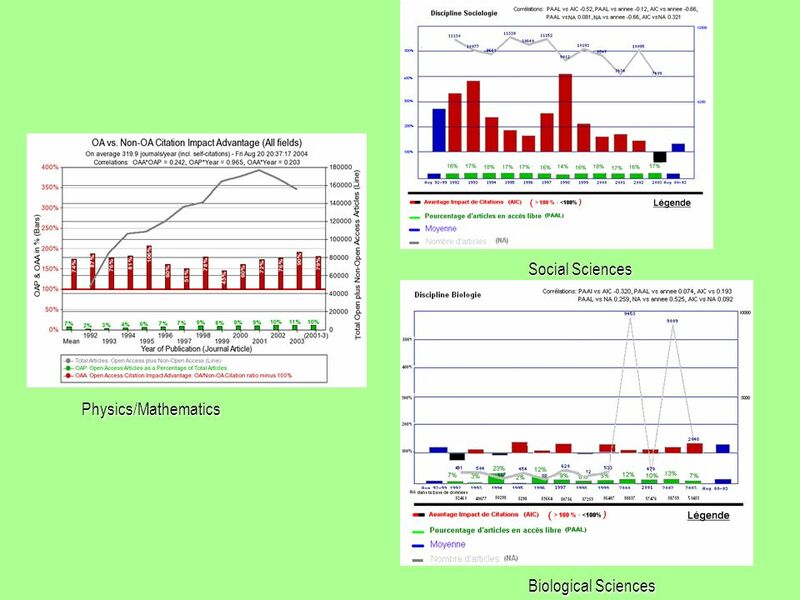 GNU EPrints Archive Software GNU EPrints is free software for creating online digital archives, principally those that store the refereed research output. A CASE STUDY OF THE ECONOMIC IMPACT OF OA ON A UNIVERSITY DONALD W. KING SCHOOL OF INFORMATION SCIENCES UNIVERSITY OF PITTSBURGH MEETING ON NATIONAL POLICIES. 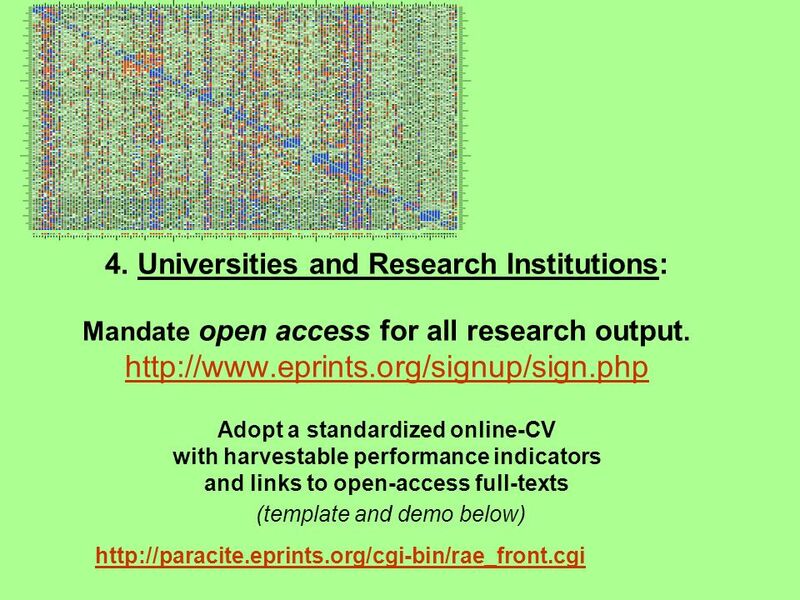 E-Print Repositories for Research Visibility: T ime to Deposit Pauline Simpson and Jessie Hey 30/10/03. E-Publications and the e-Library: Current Trends and What They Will Mean for You. Jessie Hey with Paul Boagey University of Southampton Libraries School.